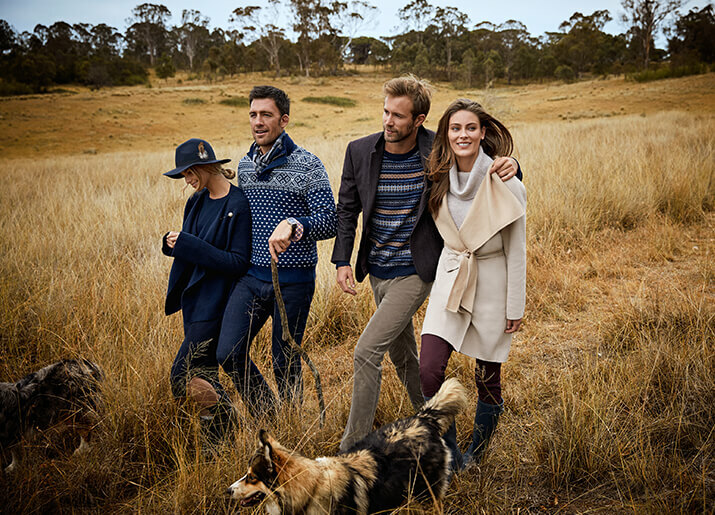 Sportscraft is an Australian heritage brand with a 103 year history. It’s continual growth and success is due to a dedication to the needs of a large community of loyal customers and an agile attitude to retail. Sportscraft’s physical store presence has always been strong, but they were early to recognise that further growth sat with digital commerce. 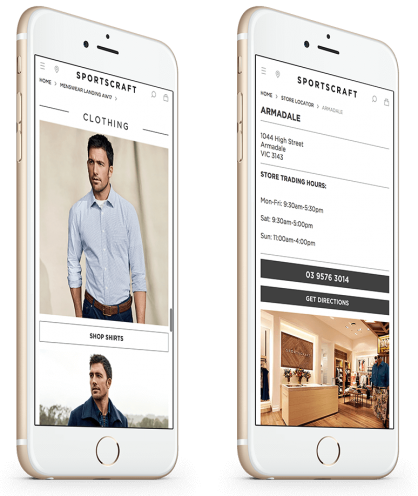 Since re-platforming in 2010, Sportscraft have leveraged the platform’s ability to provide a responsive experience and streamlined integrations. Sportscraft continues to build on an Online Team to focus on digital best practices, with a diverse age demographic, we aim to continue to support the traditional shopper as they most certainly branch out into the digital world. 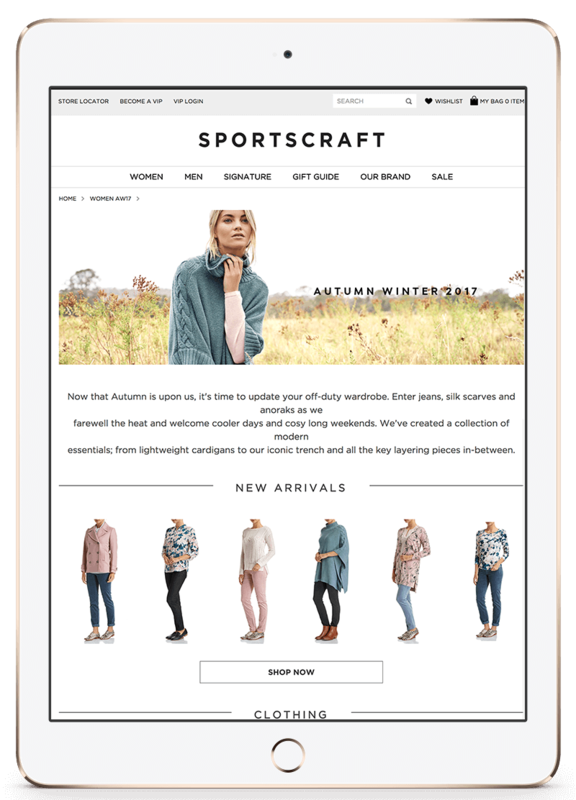 Sportscraft conveys a range of key usability features throughout the site that strictly aims to ensure that customers are presented with a seamless user experience. As the growth of technology is consistently expanding it becomes increasingly important to establish a clear connection between both online and physical stores with a balanced approach. One of the key features that has proved to be successful for Sportscraft is the implementation of Click & Collect service. The focus of developing this feature was to provide customers a means of collecting their purchase at their nearest Sportscraft store to reduce wait time as customers are instantly gratified with the collection of their new purchase on the same day. With real-time in-store stock movement updates, a fluid ‘all-device’ friendly user interface, and coupled with a frictionless one-page checkout – the development of our Click & Collect feature aims to couple both the new-age and conventional shopping approach in to one full circle omnichannel experience. Sportscraft offers services to help customers make the right purchasing choices. How we incorporate these services into our customer experience sets us apart from our competitors. Communicating the right message to our customers is our priority. Our homepage has been designed to take full advantage of our platform to make it easier to send timely messages. Our design system allows us to merchandise our storefront weeks in advance. Whether it be a new product launch or a payment method rollout, our team have the right tools to target content to our users. In our research, our customers highlighted three key factors when making a purchase: The product fit, material composition and flexible shipping. Our product description page caters to these needs with a zoomable product gallery, descriptions which detail fit and materials used in the garment and our Click & Collect store selector, giving our customers the option to pick it up at their closest store. Once customers have made their decision, they are taken to our checkout journey. We designed a one page checkout to create a frictionless experience similar to our stores. We utilise the platform and external services to pre-populate forms and allow customers to pay via their favourite payment methods such as PayPal and Afterpay. This ensures that our customers are spending less time on our storefront and more time enjoying our products. 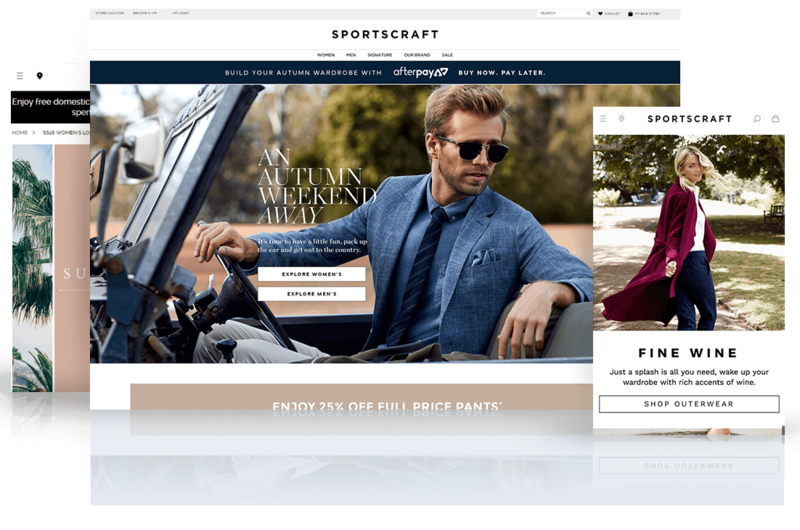 Sportscraft always aim to put themselves in the customer’s shoes and think of how the website can best serve them. For Sportscraft customers, that means being flexible, available and intuitive. To improve the customer experience, features such as click & collect, live stock levels and superior site navigation have been implemented to ensure that customers can order how they want, when they want. It was also important to remember that traffic from the website also comes from customers who prefer to try & buy in-store, so comprehensive store locators have been implemented along with an FAQ section that is based on real customer feedback and those questions most asked in product reviews and calls to the customer service center.